Chocolate has been as popular in the United States as everywhere in the world. Chocolate is a multi-million dollar business in the United States and it imports more chocolate per capita than anywhere else in the world. Its most famous and profitable chocolate manufacturer Hershey’s, is world famous and has built its reputation as the main manufacturer of chocolate in America over its long and successful history. When explorers first discovered America, natives on the border of the Caribbean Sea were found to be using tobacco and chocolate. It wasn’t for another hundred or so years, however, that chocolate was re-introduced to the country. The Italian traveller Antonio Carletti discovered chocolate in Spain in 1606 and took it to other parts of Europe. Yet it was 1765 before it made its way to America. John Hanan tookcocoa beans from the West Indies into Dorchester, Massachusetts, and refined them withDr. James Baker. America’s first chocolate factory was established there.It took several years for chocolate to become poplar in America. It was fishermen fromGloucester, Massachusetts, who set the ball rolling when they accepted cocoa beans as payment for cargo in tropical America. In 1894, sweet manufacturer Milton Hershey decided to use chocolate as a coating for his brand of caramels. He named his company the Hershey Chocolate Company. In 1900, the company started to produce milk chocolate in bars, wafers and other shapes on a large scale. This mass production enabled Hershey to reduce the cost of chocolate. The former preserve of the rich had now become a favourite of the masses. By 1905 the company had expanded so much that Hershey moved it to Pennsylvania, where local cows provided the much-needed milk to make the perfect milk chocolate. It wasn’t until 1907, however, that the famous Hershey bar we know today, first started to take shape. To expand his line of confectionary, Hershey developed the new chocolate bar as a flat-bottomed conical chocolate sweet, and named it Hershey’s Kisses Chocolate. 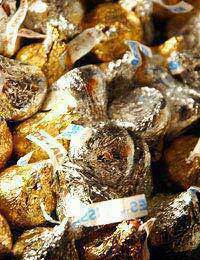 It was so successful that Hershey had the Kisses chocolate bars trademarked in 1924. New products were added to the Hershey brand, including the Mr Goodbar in 1925, Hershey’s Syrup in 1926, Chocolate Chips in 1928 and the Krackel bar in 1938. Even throughout the Great Depression, Hershey managed to turn a profit and kept his workers in employment. The Survival Ration bar for soldiers in the Second World War earned Hershey’s’ a staggering five Army-Navy “E” Production Awards for its exceptional contributions to the war effort. America’s love of chocolate is a multi-million dollar business. It took a while for its popularity to spread; however, after Milton Hershey’s decision to coat his sweets with chocolate and then produce chocolate bars that became available to the masses, the nation developed a love for chocolate that will probably never go away. Hershey’s is a stalwart of the United States, both as a successful company and as a chocolate manufacturer. It is the leading North American manufacturer of chocolate and its success continues to grow.